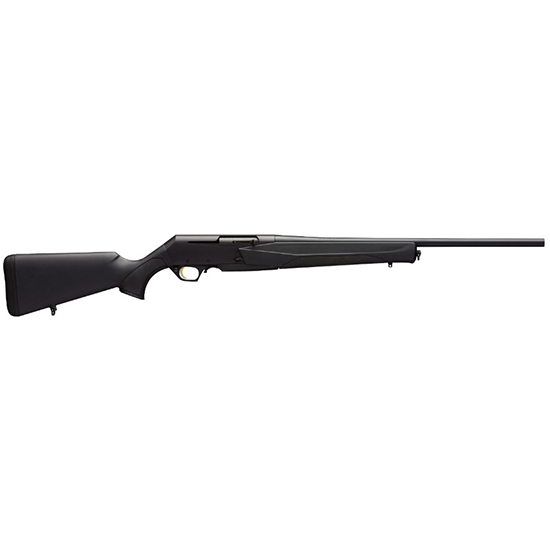 Browning 031048248 BAR MK3 Stalker Semi-Automatic 270 Winchester Short Magnum (WSM) 23 2+1 Synthetic Black Stk Black in. Brownings BAR has a long standing tradition for achieving bolt action like accuracy in an autoloading rifle. The gas system combined with a 7lug rotary bolt give the shooting significant recoil reduction for comfort while at the same time locking in bolt actionlike accuracy. The fluted stock design incorporates a full pistol grip with an undercut and is contoured while the forearm is full and handfilling. It utilizes a crossbolt safety detachable box magazine with a hinged floorplate and sling swivel studs on the stock and forearm.The MK 3 is the hunting rifle that sets the bar for every other autoloader on the planet with accuracy and speed. It features a hammerforged steel barrel and aluminum alloy receiver.This Stalker 270 Winchester Short Magnum model has a 23 barrel and synthetic composite stock with classic style lines and shim adjustable cast and drop at comb."